Aloha and thank you for your interest in ShellsHawaii.com. Creating Hawaiian heirloom jewelry is a passion for us. We use only the finest Hawaiian shells, all found locally on our beautiful beaches, and from the waters below, to create a plethora of timeless styles and classic designs. 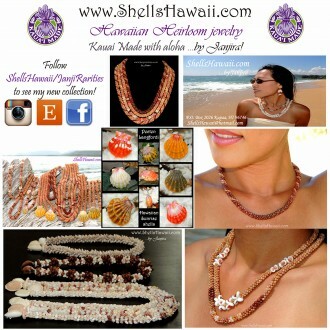 Kahelelani, Rice, Momi and Sunrise shells, to name a few, are all handcrafted with aloha into our jewelry. Every piece is Unique and designed to travel from our hearts to yours. Please check our website: shellsHawaii.com to see our extensive collection of leis, earrings, bracelets, pendants and anklets. We also do custom orders, so if you have something in mind that you do not see on our website, please just let us know. That’s shellshawaii.com. We hope to hear from you soon and would love to add you to our long list of happy customers.